The Wings of Freedom tour crew is comprised of an amazing and dedicated group of people. Pre-flight experience briefings from the crew are always captivating and suspenseful. flying in this plane is going to be unforgettable. Anticipation of the flight is seen on the faces of all the strangers who are now your companions. Eye contact is quick. Excitement sparkles in everyone’s expressions as you look for the closest open seat. Well, it is not quite a seat, but an area on the floor where thick nylon straps and a heavy metal buckle are bolted into the aircraft frame. The weight of the strap is heavy as you pull it across your waist. The flat metal insert fits into the receptacle…the handle comes down with a solid click…everyone looks around to make sure all is secure and ready for the adventure! Now we are seated, buckled and ready. 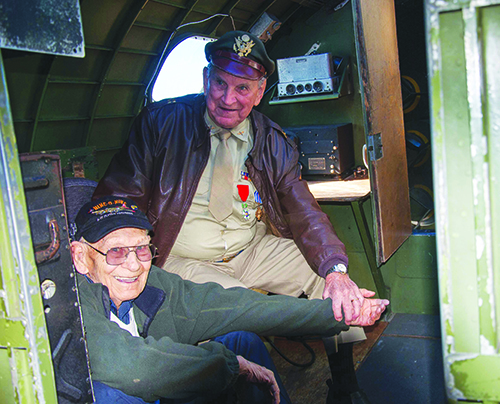 There are nervous smiles all around as the flight engineer scampers through the bomb bay, checks flight ready status and gives everyone the “thumbs up.” There are sounds of generators whining and whirling and fuel pumps pumping – then a brief silence before the first engine comes to life. The sound is incredible, unlike anything you have ever heard before. The symphony of mechanical ‘blug blug blug blug blug blug” permeates the interior with the mellow fragrance of oil and exhaust. As each additional engine starts there begins an acoustic harmony that is unique to a four engine WWII bomber. The aircraft is now alive. 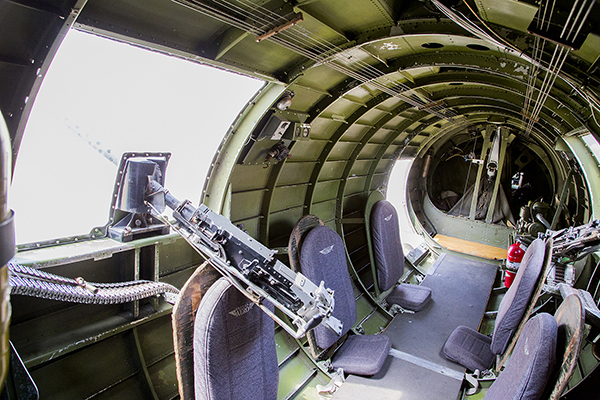 Since most flight members are seated on the floor, the only sight to the outside is up through the waist gun windows to the blue sky. At first, it is hard to tell that the B-17 is moving. Then, the brakes start to squeak and the aircraft lurches a bit. 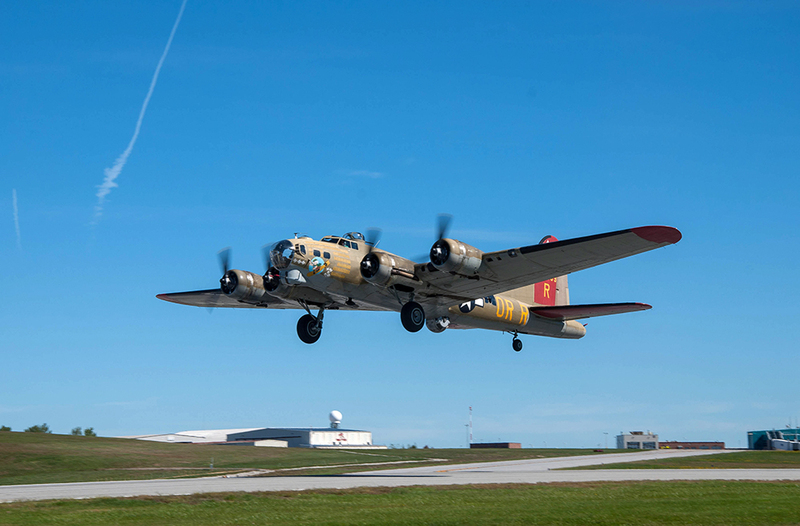 A distinctive “sleeeeek” sound and a quick jerk sends a tactile message to all – the Flying Fortress is lined up on the runway and ready to take off. Now, this part is a bit hard to describe – when all four engines reach take-off power, it’s like a line of four 1,200 hp race cars all revving to the same rpm at once. At this moment your heart skips a beat and exhilaration flows through your veins. Rumbling down the runway within seconds, the Flying Fortress is in the air! We are flying in a B-17! gun would be mounted to protect the plane and crew from diving fighters. If tall enough, you can stick your head out this opening. It is like a 130 mph convertible with wings! The 360 degree view is spectacular. Continue to move forward to the bomb bay. The catwalk is tight for anyone who is not 18-23 years old and 180 lbs or less. Careful not to hit your head as you move forward toward the cockpit and top turret positions. 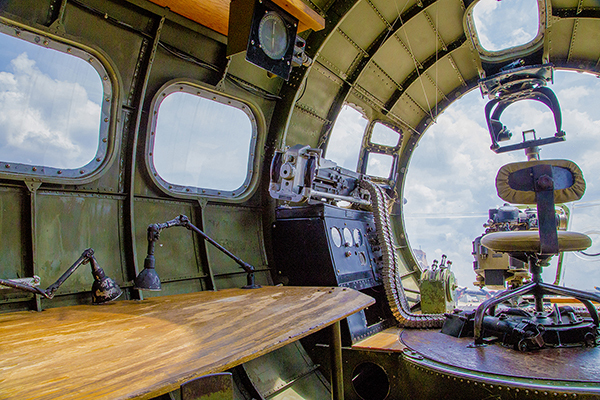 Watching our experienced pilots operate the Flying Fortress is comforting. If you are really lucky, pilot Mac McCauley (picture above) will be pilot in command. 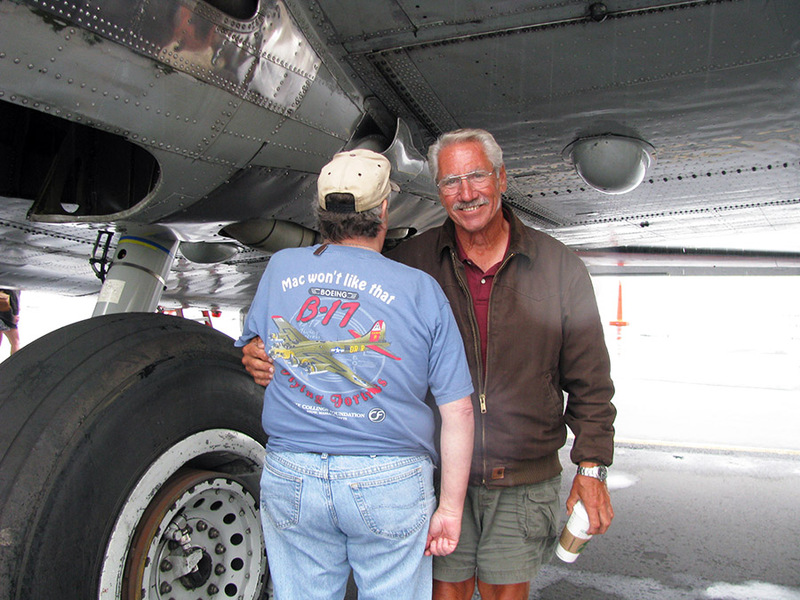 He is a legend – having flown the most hours piloting a B-17 in the history of aviation. center. The bombardier would look through the Norden bomb site to the targets below. Straight down is the ground streaking past and ahead is the fantastic horizon. From this vantage point, understanding that you are flying in a historic WWII icon grabs you hard. How incredible and scary it must have been in the 1940’s, flying at 25,000 feet, air breathable only through a mask, the temperatures mind-boggling cold. Black silhouetted specks of attacking fighters would be buzzing around like hornets and puffs of flak would explode all around you as you pray – today is not your day. 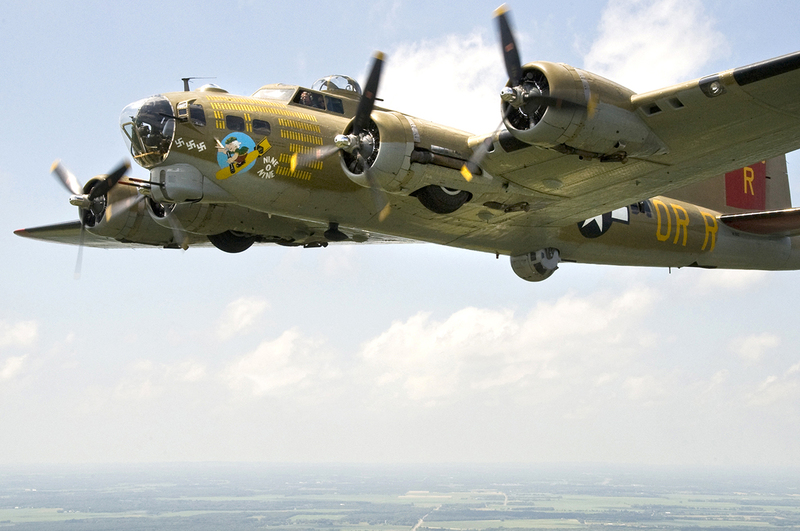 appreciate the nuances of the B-17 Flying Fortress, its guns, wires, gauges, and a sound that vibrates every cell of your body. You feel the engines start to slow and the aircraft dips. A pleasant “chirrp-chirrp” sound signals that the tires have kissed the runway and your flight is nearing its end. The B-17 taxis back to the loading area. You are not the same person who boarded. 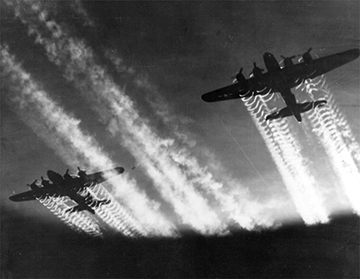 The experience of flying in a real honest to goodness WWII bomber leaves a lasting impression. Knowing looks from the flight crew as you grab onto the newly discovered hand hold and swing your feet to the pavement say it all. You have just experienced living history. flying in a fully restored WWII aircraft. 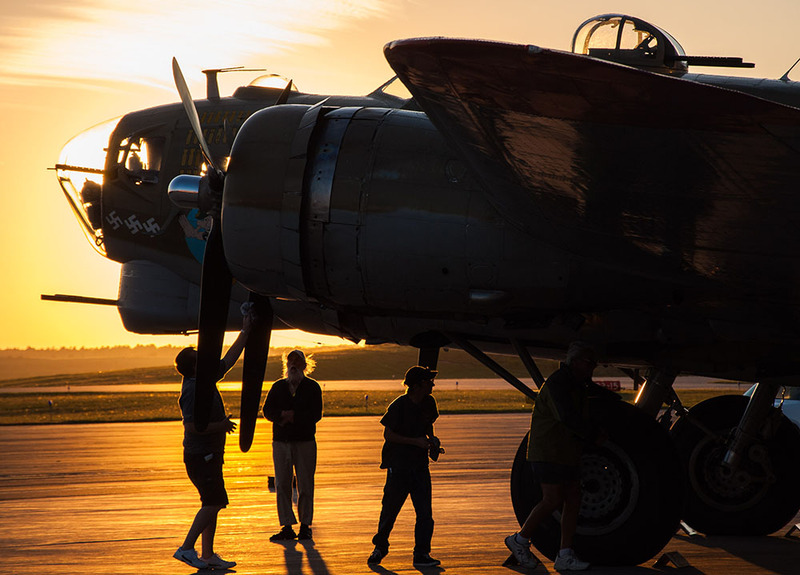 Our flight crew, coordinators, mechanics and volunteers make this extraordinary historic aircraft tour possible. To these amazing men and women we give our heartfelt thanks for creating a memory that lasts a lifetime.